We NEED YOU to help us get the attention of officials to fund RM-620 improvements. Ask CAMPO by EMAIL for prioritization of improving RM-620 to a divided 6-lane highway north of Mansfield Dam to US-183: comments@campotexas.org. Contact your local representatives (see contact list below) about the criticality of partnering to provide funding for RM-620 improvements from US-183 to Mansfield Dam. Take the longer range CAMPO regional arterials plan survey (this is separate from the email providing TIP feedback) and provide input on importance of funding RM620. “The main improvement — constructing a raised median along the entire length of RM 620 and widening from four lanes to six lanes from SH 71 to Lakeway Boulevard and Quinlan Park Road to US 183 — would substantially reduce delay and improve safety by reducing conflict points along the corridor” (see pg. 62 of the study). 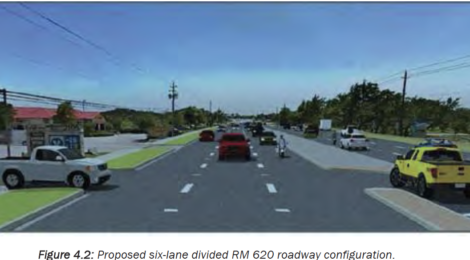 The plan also notes that “Adding sidewalks and shared-use paths along RM 620 would allow for other modes of transportation” including separation of pedestrians and bicycle riders from vehicular traffic. The $98 million southern portion of the project (south of Mansfield Dam) has been prioritized by TXDOT and is on the CAMPO TIP funding proposal for 2022. Of the project total, they are requesting $59 million from CAMPO, $39 million coming from TXDOT funds and $5 million each from the City of Lakeway and the City of Bee Cave. Unfortunately, the northern end of the proposed improvement from US-183 to Mansfield Dam has no local funding partner for TXDOT and is not currently on the proposed projects list for the CAMPO TIP – meaning it is no-where in sight. This northern segment is multi-jurisdictional including the City of Austin, Travis County, the City of Cedar Park, and Williamson County. This means while there is no clear single owner, there are many parties who could chip in to partner with TXDOT and CAMPO to fund this project. Note that TXDOT prioritizes based on partner funding so the lack of any sponsoring support from the City of Austin, Travis County or Cedar Park puts this project out of contention. We need your support more than ever to help get this project funded. The clear next step for RM-620 is to request that our local governments partner with TXDOT to sponsor funding for RM-620 from US-183 to Mansfield Dam and to request that TXDOT and CAMPO take the lead in ensuring this critical multi-jurisdictional project doesn’t fall through the cracks. None of the local governments have stepped up to own the problem or sponsor the solution – likely because they see this as “not only my problem”. But the criticality of RM-620 traffic issues and its dire forecast demand that each local government step up to do their part.